The EcoSmart BR30 8W(65W) LED Light Bulb can be used to replace an BR30 65W bulb. The bright white LED light has an 8-Watt of power and puts out 650 Lumens for up to 25,000 life hours. The energy-efficient LED bulbs offer you an estimated energy savings of $156 per bulb over the course of the bulb's life. This light can be dimmed for convenient light customization and helps conserve energy over the life of the bulb. Minimum starting temperature -40F (-200C). 1,C35 CLASSIC GLASS FILAMENT, 2,This 4.5 watt LED bulb provides daylight light similar to a 40 watt B11 Incandescent bulb while generating less heat, 3,120 volt 4.5 watt 5000 K(DAYLIGHT),E26, 4,Use Only on 120 Volt, 60Hz Circuits. 5,Light appearance: Brightness 470 lumens, Efficiency 104.44 Lumens/Watts, Energy used 4.5 Watts, Life 15,000 Hours, Colour rendering index (CRI) 80 CRI. 1,CL35 ANTIQUE GLASS FILAMENT, 2,This 4.5 watt LED bulb provides amber light similar to a 40 watt B11 Incandescent bulb while generating less heat, 3,120 volt 4.5 watt 2200 K(AMBER),E12, 4,Use Only on 120 Volt, 60Hz Circuits. 5,Light appearance: Brightness 320 lumens, Efficiency 71.11 Lumens/Watts, Energy used 4.5 Watts, Life 15,000 Hours, Colour rendering index (CRI) 80 CRI. This EcoSmart Connected LED light bulb can be controlled via your smart phone from anywhere, anytime. You can also sync them with other smart products with Wink system, program dims or highlights for the perfect setting, and automate them to fit your schedule. Compatibled with Wink Hub, you can connect the light bulbs with the Wink Hub or Wink Relay. With EcoSmart Connected bulb, you can automate your lighting to turn on when you wake up, turn off when you leave, or dim when bedtime approaches. And controls the lighting even when you are on a vacation. The EcoSmart Connected bulbs can be controlled individually or as a group when you have installed them in different area of your house. From the ballroom to your living room, EcoSmart LED chandelier bulbs provide the elegance you need for all occasions. EcoSmart LED bulbs are specifically designed to create a warm and inviting atmosphere in any home, like that of an incandescent light bulb. This Soft White 2700K LED chandelier bulb is designed to provide the warm and inviting light that you and your family will enjoy in your home for 25,000 hours, while using 87% less energy than your standard incandescent light bulb. EcoSmart bulbs deliver maximum energy efficiency and savings to consumers nationwide. 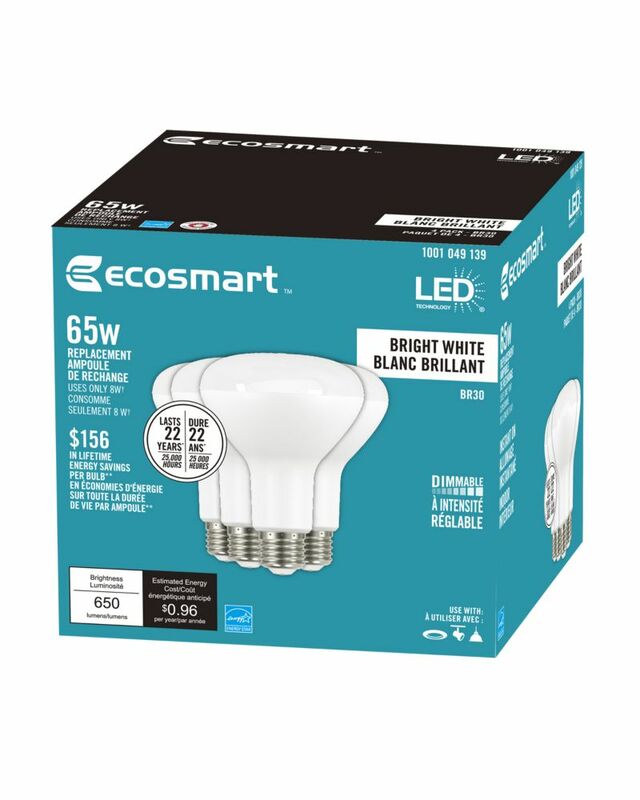 65W Equivalent Bright White (3000K) BR30 Dimmable LED Light Bulb (4-Pack) - ENERGY STAR The EcoSmart BR30 8W(65W) LED Light Bulb can be used to replace an BR30 65W bulb. The bright white LED light has an 8-Watt of power and puts out 650 Lumens for up to 25,000 life hours. The energy-efficient LED bulbs offer you an estimated energy savings of $156 per bulb over the course of the bulb's life. This light can be dimmed for convenient light customization and helps conserve energy over the life of the bulb. 65W Equivalent Bright White (3000K) BR30 Dimmable LED Light Bulb (4-Pack) - ENERGY STAR is rated 1.0 out of 5 by 2. Rated 1 out of 5 by Calvin from Doesn't last long Bought 2 boxes and bulbs started dying after couple of months. I thought I purchased defective boxes. So I Bought 2 more and they also died quickly. All within 6 months time. Don't waste your money on these. I can't believe Home Depot is still selling this garbage. Rated 1 out of 5 by blaz from Lasted a year These are advertised starting 25000 hours. That is a joke. Have about 8 of these and 2 have already flaked out. May as well spend the extra bucks elsewhere. Pretty disappointing.